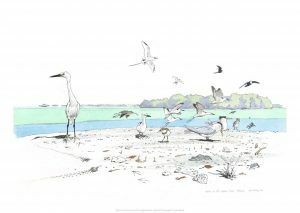 The print of Birds on the Lagoon Shore, Aldabra is now available through our online shop. The high quality Giclée prints are printed to order and can be posted to addresses world-wide. If you are interested in any of the original artworks please email us to check on their availability. Writing about his experiences in Aldabra John wrote: “I am always interested in the ‘character’ of a bird that is to say its body movements, the tenseness of its hunting and the relaxation of its preening. We will donate 25% of the purchase price to the Aldabra Clean Up Project.